Strategic Finance™ is the award-winning flagship publication of IMA® (Institute of Management Accountants). Every month, our thought-provoking articles offer advice that helps financial professionals perform their jobs more effectively, advance their careers, grow personally and professionally, and make their organizations more profitable. SF is consistently rated by IMA members as one of the most accessed and valued benefits of membership. SF articles are written with the practitioner in mind. Our goal is to cover all the important topics and trends that impact accountants and financial professionals in business, including sustainability, risk management, strategy, financial planning, the changing roles of the CFO and the finance function, budgeting, capital decisions, technology, careers, leadership, and more. For general editorial feedback and suggestions and to send information about corrections, please contact Christopher Dowsett, Editor-in-Chief, cdowsett@imanet.org. For information on partnerships and advertising, download our 2019 SFmedia_kit2019 and visit www.imanet.org/about-ima/partnerships-advertising. Strategic Finance is indexed in the Accounting and Tax Index by ProQuest at www.proquest.com. Except as otherwise noted, the copyright has been transferred to IMA® for all items appearing on this website. For those items for which the copyright has not been transferred, permission to reproduce must be obtained directly from the author or from the person or organization given at the end of the item. Views expressed are authors’ and do not represent IMA policy unless so stated. Publication of paid advertising and new product and service information does not constitute an endorsement by IMA of the advertiser or the product or service. Strategic Finance™ (ISSN 1524-833X) Copyright © 2018 by IMA. Published by the Institute of Management Accountants, 10 Paragon Drive, Suite 1, Montvale, NJ 07645. Phone: (201) 573-9000. 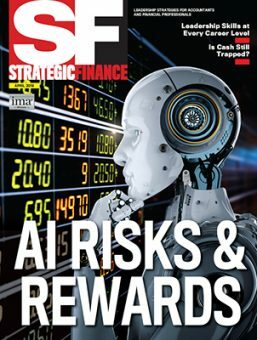 To order back issues of the print edition of Strategic Finance, download and complete the Strategic Finance back issue order form. For questions about missing issues or address changes, please contact IMA Member Services at ima@imanet.org or call (800) 638-4427 or (201) 573-9000. For address changes, IMA members can also log on to www.imanet.org and update their contact information directly in the My Profile section. Please allow 6-8 weeks for the changes to be reflected in the magazine mailing label. IMA, the association of accountants and financial professionals in business, is one of the largest and most respected associations focused exclusively on advancing the management accounting profession. 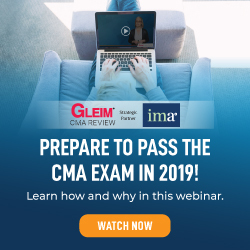 Globally, IMA supports the profession through research, the CMA® (Certified Management Accountant) program, continuing education, networking, and advocacy of the highest ethical business practices. IMA has a global network of more than 100,000 members in 140 countries and 300 professional and student chapters. Headquartered in Montvale, N.J., USA, IMA provides localized services through its four global regions: The Americas, Asia/Pacific, Europe, and Middle East/India. For more information about IMA, please visit www.imanet.org.